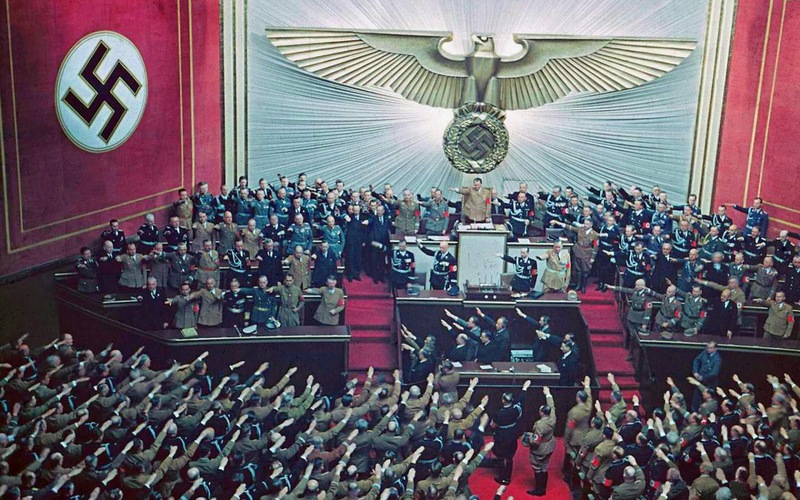 Ovation for Hitler in the Kroll Opera House after announcing the successful Anschluss, March 1938. The Anschluss (German for “union”) was the annexation of Austria into Nazi Germany in March 1938. One of the Nazi’s ideologies was to re-unite all Germans either born or living outside of the Reich in order to create an “all-German Reich”. From the early beginning of his leadership in the Nazi Party, Hitler had publicly stated in his 1924 autobiography (Mein Kampf) that he would create a union between his birth country and Germany, by any means possible. On the morning of 12 March, the 8th Army of the German Wehrmacht crossed the border to Austria. The troops were greeted by cheering German-Austrians with Nazi salutes, Nazi flags, and flowers. Because of this, the Nazi annexing was also called the Blumenkrieg (war of flowers). For the Wehrmacht, the invasion was the first big test of its machinery. Although the invading forces were badly organized and coordination among the units was poor, it mattered little because no fighting took place. Another photo from a different event but with the same style. Hitler’s car crossed the border in the afternoon at Braunau, his birthplace. In the evening, he arrived at Linz and was given an enthusiastic welcome. 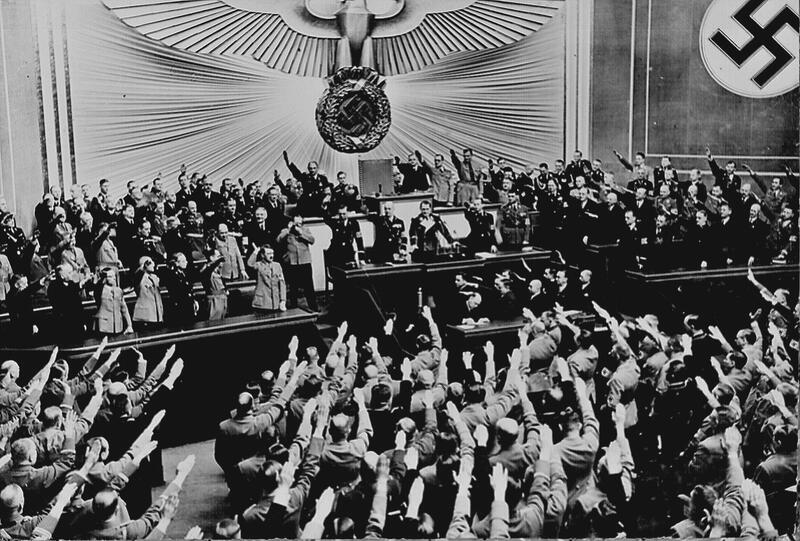 The enthusiasm displayed toward Hitler and the Germans surprised both Nazis and non-Nazis, as most people had believed that a majority of Austrians opposed Anschluss. Hitler had intended to leave Austria as a puppet state with Seyss-Inquart as head of a pro-Nazi government. However, the overwhelming reception made him to change course and formally absorb Austria into the Reich. Hitler’s travel through Austria became a triumphal tour that climaxed in Vienna, on 15 March 1938, when around 200,000 German-Austrians gathered around the Heldenplatz (Square of Heroes) to hear Hitler say in front of tens of thousands of cheering people that “The oldest eastern province of the German people shall be, from this point on, the newest bastion of the German Reich”. The photograph was taken in the Kroll Opera House, where the (puppet) Reichstag relocated after the Reichstag fire of 1933. HistoryFan is correct, that picture is not from the Reichstag. Please correct the title accordingly.